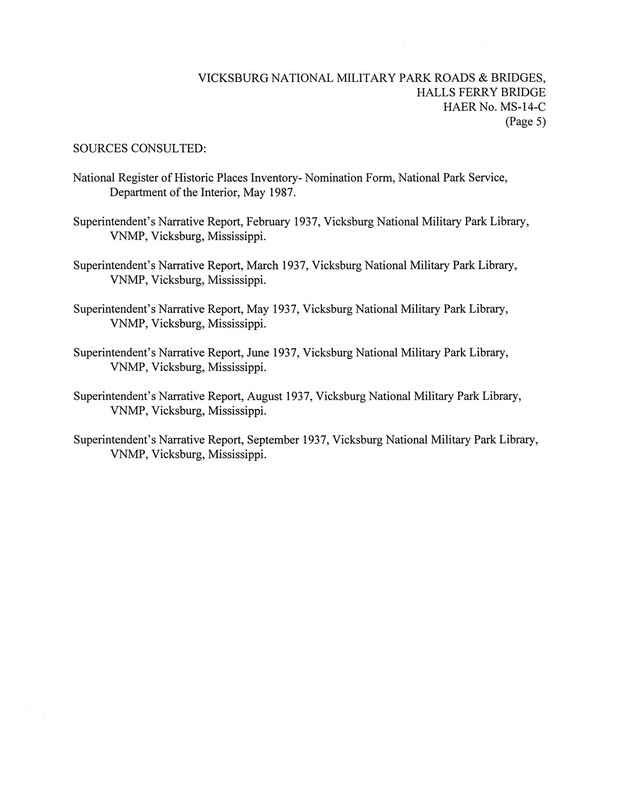 The Historic American Engineering Record (HAER) was established in 1969 by the National Park Service, the American Society of Civil Engineers and the Library of Congress to document historic sites and structures related to engineering and industry. 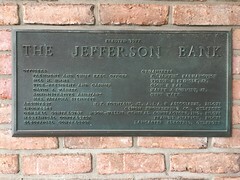 This agreement was later ratified by four other engineering societies: the American Society of Mechanical Engineers, the Institute of Electrical and Electronic Engineers, the American Institute of Chemical Engineers, and the American Institute of Mining, Metallurgical and Petroleum Engineers. Appropriate subjects for documentation are individual sites or objects, such as a bridge, ship, or steel works; or larger systems, like railroads, canals, electronic generation and transmission networks, parkways and roads. 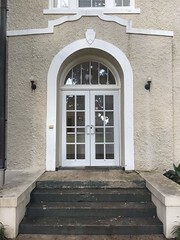 HAER developed out of a close working alliance between the Historic American Buildings Survey (HABS) and the Smithsonian Institution’s (SI) Museum of History and Technology (now the Museum of American History). From its inception, HAER focused less on the building fabric and more on the machinery and processes within, although structures of distinctly industrial character continue to be recorded. 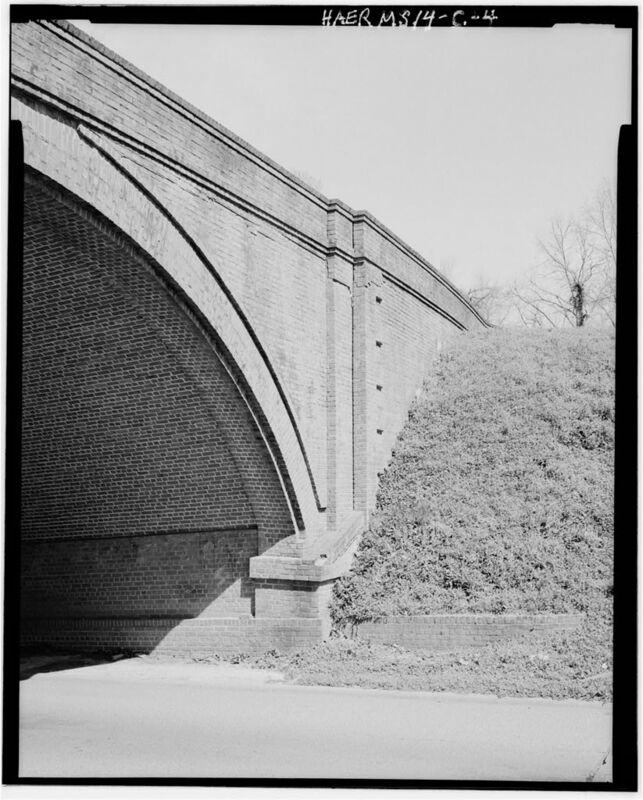 As the most ubiquitous historic engineering structure on the landscape, bridges have been a mainstay of HAER recording; HABS also documented more than 100 covered bridges prior to 1969. In recent years, maritime documentation has become an important program focus. 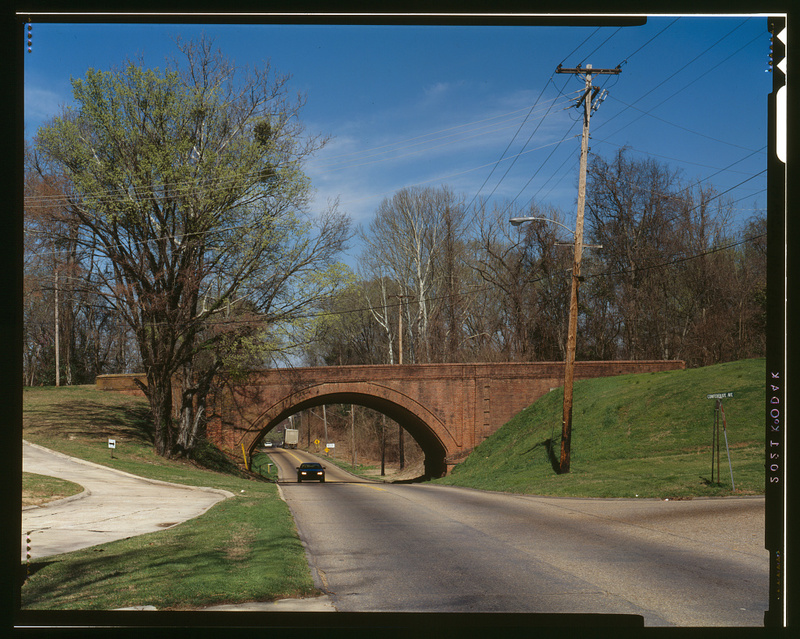 Since we don’t have a tremendous number of engineering landmarks, Mississippi has minimal representation in HAER, but the arched Confederate Avenue bridge over Halls Ferry Road is one of them, probably because it has an NPS-related history. 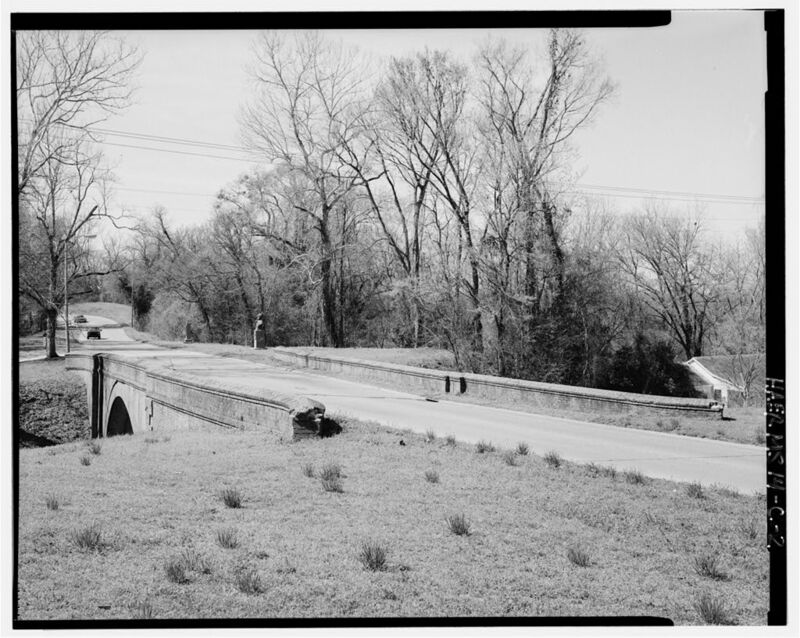 Maybe you didn’t know it, but HABS/HAER/(now joined by HALS–Historic American Landscape Survey) is still going, and unlike many of the HABS properties we’ve posted that were photographed in the 1930s, this bridge documentation took place relatively recently, in 1997. 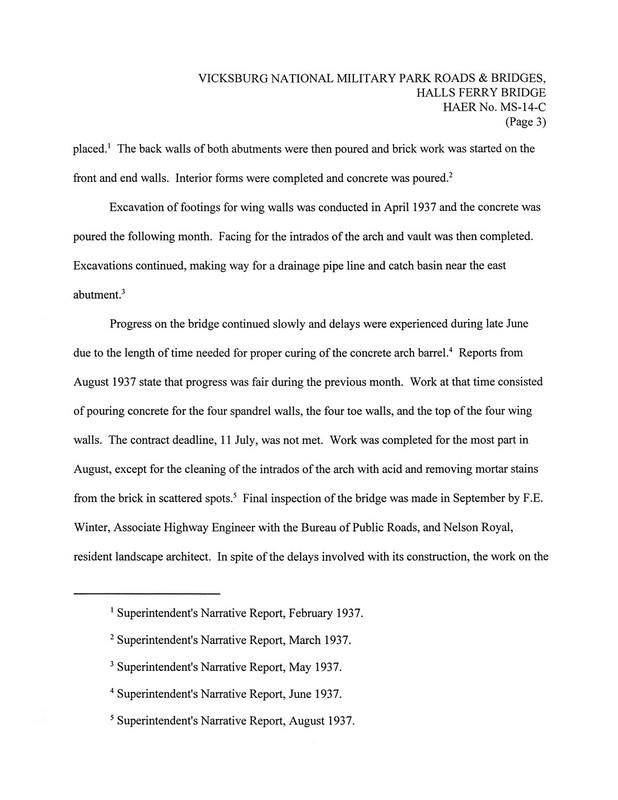 Also unlike the sparse Data Sheets from the 1930s survey work, this HAER project has a helpful history of why and how the bridge came to be built. 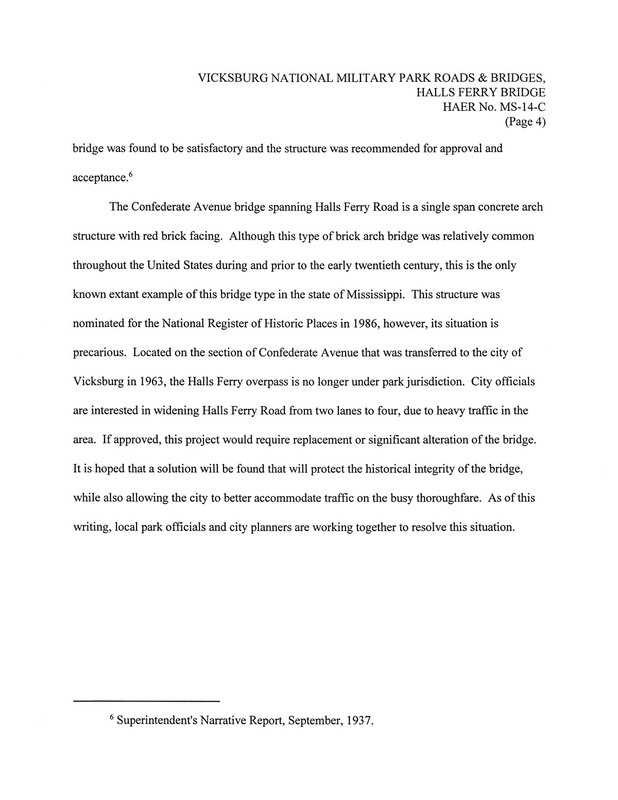 Significance: Constructed over five months in 1936-1937, the Confederate Avenue bridge spanning Halls Ferry Road is the only extant bridge of its type in the state of Mississippi. 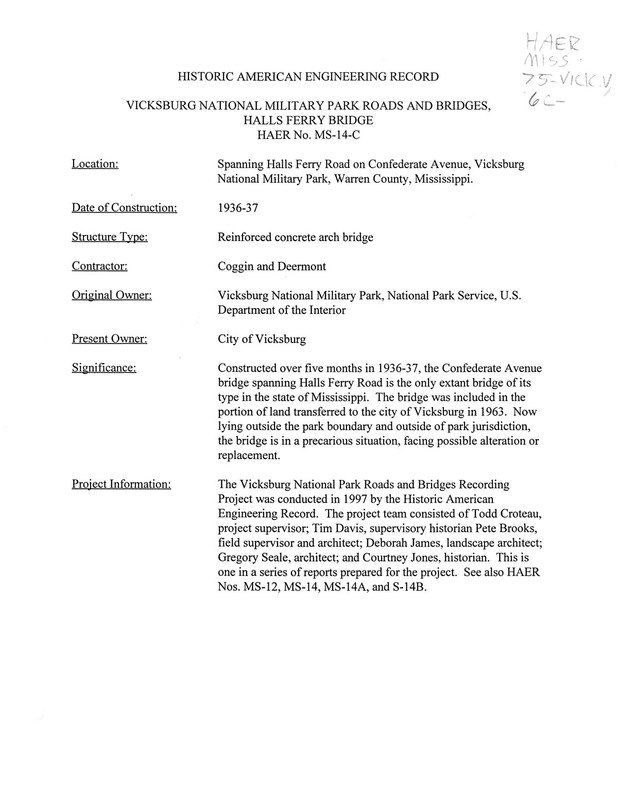 The bridge was included in the portion of land transferred to the city of Vicksburg in 1963. 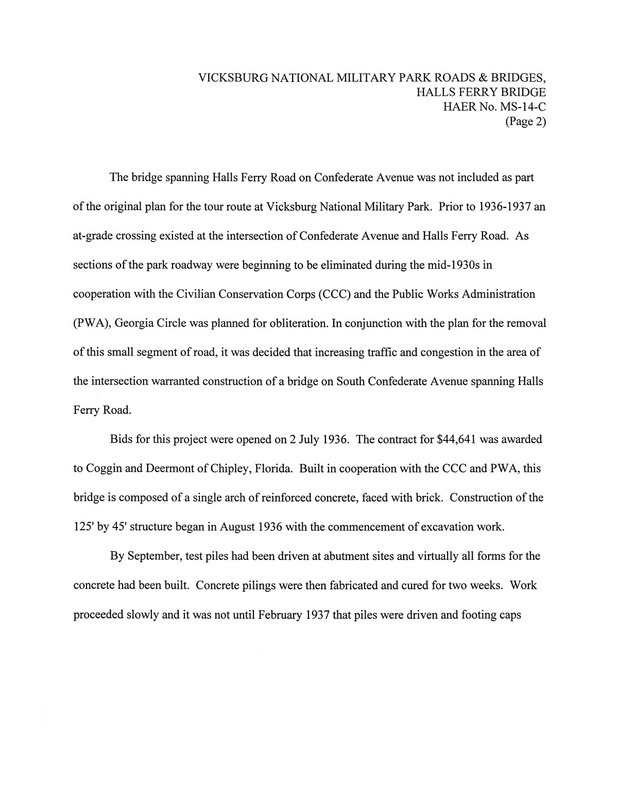 Now lying outside the park boundary and outside of park jurisdiction, the bridge is in a precarious situation, facing possible alteration or replacement. 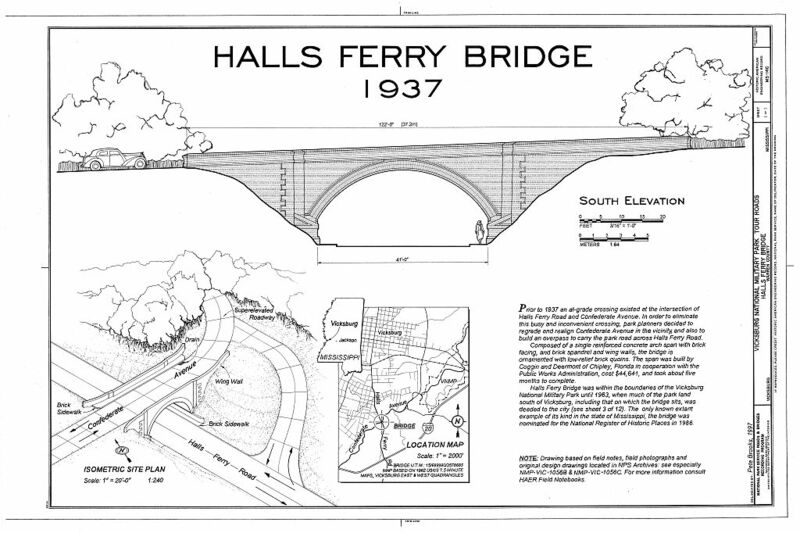 HALLS FERRY BRIDGE, ELEVATION VIEW TO THE NW. Color transparency, William A. Faust II, Photographer, 1997. 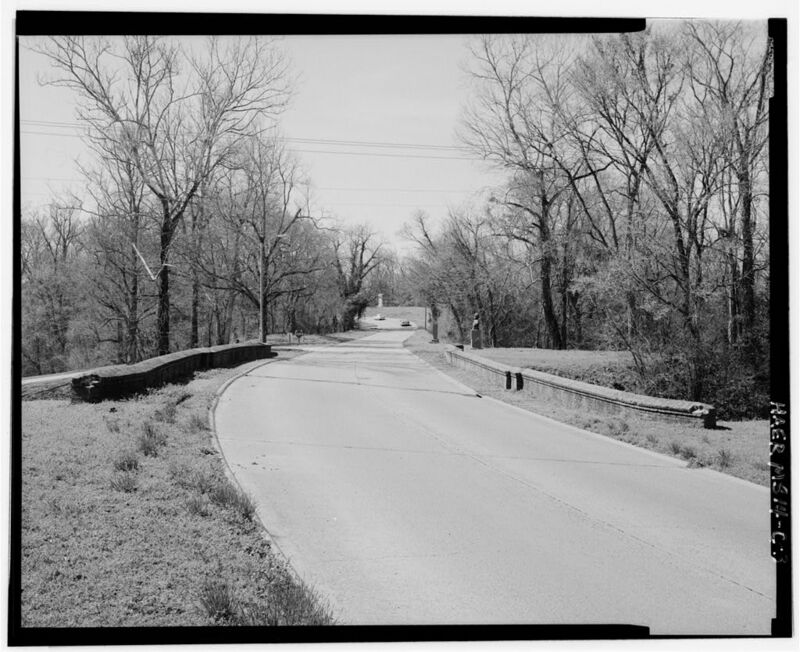 HALLS FERRY BRIDGE, PERSPECTIVE VIEW TO THE WEST. William A. Faust II, HAER Photographer, 1997. HALLS FERRY BRIDGE, DECK VIEW TO THE SW. William A. Faust II, HAER Photographer, 1997. HALLS FERRY BRIDGE, VIEW OF ABUTMENT AND UNDERSIDE OF BRIDGE, LOOKING NE. 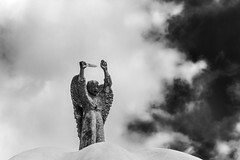 William A. Faust II, HAER Photographer, 1997. Love HABS? So do we! Is/could/should the MS River Basin Model included in any HAER work? 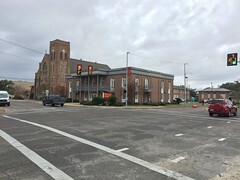 Yes, the River Basin Model in Clinton is partially covered by the HAER documentation of the Waterways Experiment Station, Hydraulics Laboratory in Vicksburg. Good eye, Thomas–I hadn’t noticed that entry includes several aerial shots of the Lower MS River Basin Model as well as some detail shots of machinery and instruments! The history also helps me understand for the first time how the LMRBM fits into the larger context of the work the Waterways Experiment Station did/does. I’ll have to pull out those photos for a HAER post on the model. How cool–another New Deal accomplishment I did not know about! 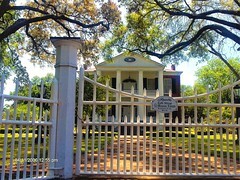 This Vicksburg brick bridge is very similar to the kudzu-covered bridge bridge in Natchez where an abandoned portion of Old Washington Road crossed the headwaters of Spanish Bayou – it lies on the part of the Forks of the Road slave market site that is owned by the City of Natchez, designated for donation to Natchez National Historical Park. 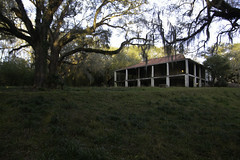 I think this photo was made not long after completion. Perhaps it has been posted here previously but I’d like to add it for those who might have missed it. It is my favorite of a bridge that I’ve traveled over/under countless times. And when you blow your horn while passing underneath it, you get a pretty cool echo!